Hello and Happy New Year! I hope everyone had a great holiday season. I’m pretty sure I spent 50% of my time between Christmas and New Year’s doing dishes. How about you? After taking a long winter’s nap, TV is back in the full swing of things this week so let’s get to it. Bunheads returns tonight at 9 p.m. on ABC Family. As you know, I can’t decide if I love or hate the fact that the series is basically Gilmore Girls Redux. When The Newsroom premiered, someone clever put together a video clip of how Aaron Sorkin often uses the same dialogue. I’m fairly confident someone could do the exact same thing with Amy Sherman–Palladino. Whole scenes from Bunheads seem directly lifted from Gilmore Girls. The series gives me a sense of déjà vu every time I watch it. 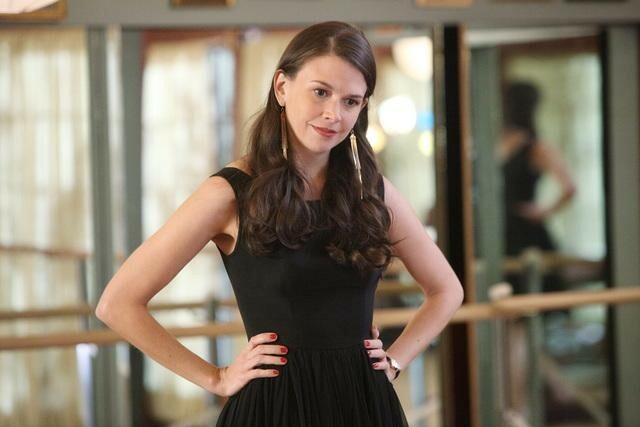 On Bunheads, Michelle is Lorelai. Fanny is Emily Gilmore (she’s even played by the same actress). Paradise is Stars Hollow. Sasha, Boo, Ginny and Melanie are Rory and her friends. (With Boo being my favorite. I love her.) I understand Sherman-Palladino’s desire to recreate the magic of Gilmore Girls and not veer too far outside her comfort zone. (Anyone remember The Return of Jezebel James?) The acting on the show is terrific. I like that, like Gilmore Girls, it’s a show that can play to multiple generations. We really don’t have enough of that on TV. (ABC Family really excels in this area. Switched at Birth, which also returns at 8 p.m. tonight, is another show multiple generations can watch together). I also like that the show has teenage characters who aren’t vampires and aren’t behaving older than they should be for their age. And like Gilmore Girls, Bunheads does a great job of making even the show’s secondary and tertiary characters fantastic. I’m particularly fond of Truly (Stacey Oristano, who played Mindy Riggins on Friday Night Lights) and Boo’s mother Nanette (Jennifer Hasty). However, Bunheads is missing any real conflict. The entire premiere is spent with Michelle back in Vegas living with her friend and performing with a cheesy magician in Henderson. But here’s the thing: We all know there’s no way Michelle is staying in Vegas. We all know she’s going to return to Paradise. There wouldn’t be a show if she didn’t. So despite the enjoyable performance and fun banter (seriously I would watch the fabulous Kelly Bishop have a tete-a-tete with anyone), the whole hour feels like we’re just biding our time until Michelle makes her inevitable return. The trick on a TV show is to make something the audience knows is going to happen interesting (see what How I Met Your Mother did with Barney’s proposal to Robin) and the Bunheads premiere doesn’t pull that off. Bunheads is also missing its Luke. I enjoy still getting to see Alan Ruck in flashbacks but with Hubbell dead, Michelle needs a romantic interest, one that the audience can root for. What do you think about Bunheads? Are you going to watch tonight’s premiere? Talk about it below. NBC premieres Deception tonight at 10 p.m. The hour long drama plays out like someone said “Hey, you know how ABC has a hit on its hands with Revenge? We should totally do that.” The series is a blatant, but not at all clever, attempt to capitalize on Revenge’s popularity last season. Detective Joanna Locasto (Meagan Good) returns to place she grew up to investigate the death of her former best friend Vivian Bowers. The FBI has been investigating the Bowers family and is convinced that Vivian’s death wasn’t an accidental overdose. There are plenty of bad shows on TV but I always get particularly upset when I don’t like a show that features so many actors I do like. Deception stars Victor Garber (Alias), Tate Donovan (Damages) and Marin Hinkle (Once & Again). That’s a lot of great talent to waste on such a boring show. And the kicker is that the series gets even more dull in next week’s episode. My official review is: BOOOOOO! I’m at the Television Critics Association Press Tour this week. I’ll be gathering as much fun TV information as I can to share with all of you. Have a question? Seen a familiar face? Hear a great TV quote? Email me through my contact page and let me know.